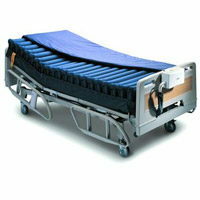 Unlike other companies, Hospice Express provides FULL ELECTRIC hospital beds to all your patients. This bed comes complete with either a foam or an innerspring mattress and bed rails. 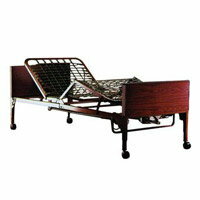 While often part of a bed package, these bedside tables height adjust as well as tilt to conform to patient positioning. 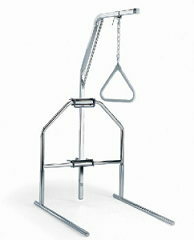 Our trapeze bars provide added security for patient and caregivers during positioning changes in the bed. These bars clamp to the headboard of the bed or can be mounted to an independent stand when used with institutional-type of hospital beds. 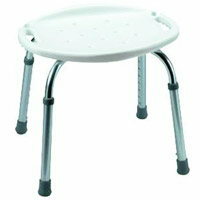 We offer a variety of commodes including standard, heavy-duty, extra-wide, and drop-arm models. 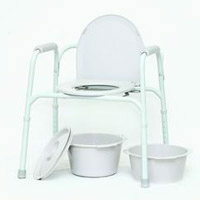 Each commode is made of heavy-duty steel, complete with bucket and splash guard. 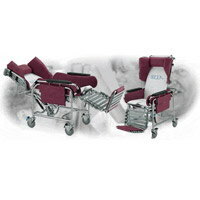 Products such as bath seats and benches provide patient and caregivers with more options for patient care. Bathing activities can be enhanced with proper bath safety equipment that is made from both mildew and corrosion-resistant materials. Hospice Express offers both manual and electric patient lifts. Our lifts safely transport patients from 450 to 650lbs, and utilize a variety of slings for everyday care. 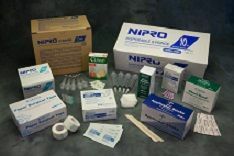 For patients that need pressure reduction, Hospice Express offers everything from gel and alternating pads, to low-air loss systems and bariatric solutions. In addition, routine maintenance can often be done without even disturbing the patient. 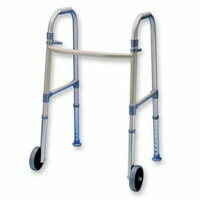 Hospice Express provides a variety of walkers, wheeled walkers, canes, and light-weight transport chairs for those who need assistance with their ambulatory needs. Safety and comfort is never out of reach for patients that are in your scope of care. 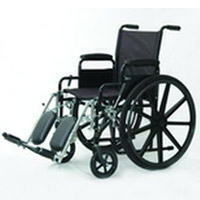 Since there is not a one-size-fits-all wheelchair, Hospice Express specializes in maintaining a wide range of sizes to meet the seating needs of your patients. 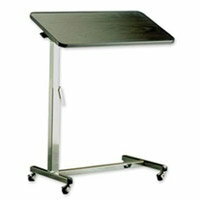 We inventory narrow, hemi-height, standard, wide, extra-wide, and even bariatric. Specialty chairs can often be difficult to find when your patient really needs one. However, Hospice Express offers everything from semi and full-recliners, to chairs that tilt-in-space. The right type is always available depending on your organization's preferences. Since a variety of needs exist when it comes to oxygen therapy, Hospice Express provides it all. We have concentrators with flow rates up to 10 liters, gaseous cylinders, liquid units and backup oxygen. 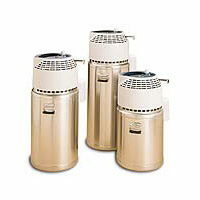 In addition, we have crush-resistant oxygen supplies as well as color-visible oxygen tubing to enhance patient safety. 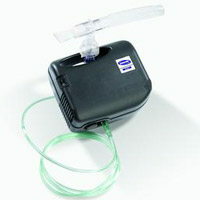 In addition to providing oxygen equipment, we also provide both CPAP and BiPAP machines. Our therapists set all the prescribed pressures prior to delivery and can assist your staff with mask fittings, ramp pressure settings, and patient compliance. 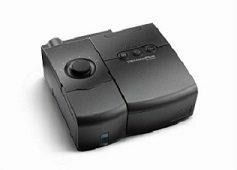 Our small, compact nebulizer machines administer excellent breathing treatments in a quiet and non-invasive manner. Kink-resistant tubing and high-efficiency nebulizers are standard with each setup. 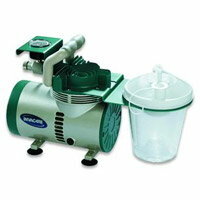 High-performance suction machines provide adjustable vacuums from 0-560mmHg and air flow of 0-34lpm. Easy-to-read gauges, single-use collection jars, and control-vent suction catheters improve suction therapies for caregivers and patients. Unmatched by our competition, Hospice Express offers over 11,000 catalog items for your organization's needs. Everything from Abdominal Binders to Zipper Lock Bags, we've got you covered A-Z.